20 Amazing Adventures Near Vancouver, B.C. The Lower Mainland Ecoregion—the area surrounding Vancouver, B.C.—is a land of verticality. Its old-growth forests are dominated by cedars and firs hundreds of feet high and a thousand years old. It is a land of snow and ice, of rocky slopes, of alpine lakes and waterfalls. Adventures into this wilderness wonderland are likewise tests of gravity: fight it, flow with it or sit under a tree and watch it work, letting the falling pine cones drill you into comatose hallucinations of bomber crimps at Stawamus Chief and singletrack on the North Shore. Vancouver’s urban core sits in a basin surrounded by the Coast Mountains and is split into three main areas. To the northwest, the Sunshine Coast is characterized by fjord-like inlets and remote access, only to be visited by ferry or air. To the east is Fraser Valley, a bucolic land of agriculture and civil obedience. To the south is the United States, and that’s great and everything. But to the north—Sea to Sky country: Whistler and its famous chirping marmots; the Black Tusk, a pillar of volcanic rock that juts like a necrotic molar from the Garibaldi Range; the aforementioned Stawamas Chief with its grand, granite, multi-pitch wall; staircase hot springs and celadon cascades. Fall Colors at Brandywine Meadows. Photo by Duncan Sadava. Attached are 20 of the Lower Mainland’s finest adventures to get you started in the temperate rainforests of Canada’s British Columbia, where the King’s English is punctuated “eh” and your average summer adventure includes brushing the sky. ​For sheer variety, it’s hard to beat Tenquille Lake. Get your bang for your buck here (hunting is not an option): hiking, camping, fishing, mountain biking and horseback riding are all available, and adventurers have the option of staying at an alpine hut adjacent the lake. Sink into Tenquille’s cool waters on a hot day, or wander its shoreline trail, foraging for wild mountain blueberries. The Joffre Lakes area is an iconic piece of Canadian alpine wilderness, and thanks to its accessibility, it is one of the most popular adventures in the Sea-to-Sky corridor. One of the few half-day hikes in the area, this walk still offers spectacular mountain scenery: Matier Glacier seems to hang from a cliff, and Joffre Creek drops from lake to lake in beautiful little cascades. Perfect if you’re short on time! If you have a little more time to spend, consider Lilloet Lake Campgrounds. Few in the Lower Mainland can compare to Lilloet Lake’s sheer size, and there’s no better freshwater attraction for boating, canoeing or kayaking. Perfect growing conditions and safety from fire and disease characterize this pocket of old growth on the Ancient Cedars Trail Hike near Whistler. Some trees in this stand of cedars were saplings at the same time as the First Crusade, when the Anasazi were hollowing out cliffside dwellings at Mesa Verde. Some of the best mountain biking in the Lower Mainland is on the North Shore, but don’t sleep on the mountain biking trails in South Whistler. It’s Business Time is a challenging thrill ride that intermediate and advanced riders can dig. Absolutely under appreciated, Ring Lake Trail is premier backcountry hiking with wide open spaces and flashes of wildflower color. The 12-mile trip might scare away most, but hearty spirits will find an alpine paradise without a soul in sight. 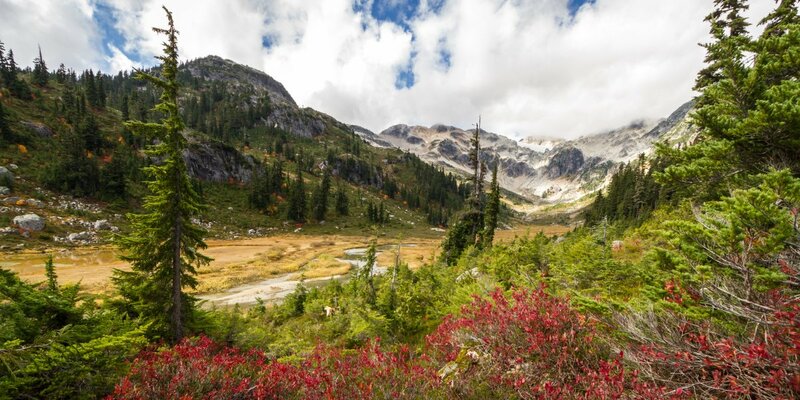 Those with four-wheel drive might explore Brandywine Meadows over the Joffre Lakes for a quick-access alpine hike. It's harder to get to, but it offers the same spectacular views in a dog-friendly, less-traveled package. The Black Tusk is an iconic and spectacularly beautiful backcountry hike. Well-maintained with whistling marmots. Just outside Squamish, Valleycliffe offers hundreds of kilometers of mountain biking trail. It is less visited than the North Shore or Whistler, so let loose on this singletrack. Hard to imagine passing Stawamus Chief Provincial Park and Campground without sweaty palms. Camp beneath the face of the Grand Wall and set yourself up for other Squamish adventures, too. Way off the beaten path, Mount Steele Hike on the west side of Tetrahedron Provincial Park offers solitude and a lakeside cabin. A visit to Vancouver isn’t complete without Stanley Park. The urban oasis is highly manicured, but it is a monument to Vancouver’s appreciation of the natural world. Sloquet Hot Springs has three pools that are ideal for relaxing. This is several hours away from Vancouver, so make a weekend of it. Take candles! A mountain biking classic, Old Buck - Pangor Loop is a white-knuckle thrill-ride on the North Shore's Mount Seymour. Sasamat Lake is a mellow getaway close to the city. Great for flat-water paddling and swimming. The Lower Falls Trail to Gold Creek Falls is a great introduction to the Lower Mainland’s backcountry excursions. The more spectacular of the hot springs listed here, Keyhole Hot Springs / Pebble Creek Hot Springs descends stepwise toward the Lilloet River. Three-pitch climbing on granite at Star Chek offers amazing views. Visit in spring and fall when the river below rages. Cat Lake has your camping and swimming options in a quiet setting north of Squamish. Space to spread out and mountain biking, too. Hike to Brew Lake for incomparably rugged terrain and views to match. The trail is a hefty challenge, both technical and steep, but the payoff is an alpine cabin and a feeling of remoteness.